From new support group opportunities to preparing freezer meals for patients, and even learning to dance the tango, there are fun and exciting things happening to support patients through the Oregon Cancer Foundation. The following support groups and classes are hosted by Oregon Cancer Foundation at our office at 2296 Oakmont Way in Eugene. Registration is now open for OCF’s Spring Survivorship Series, a 10-week series of classes that provide information and support to manage the challenges that arise after cancer treatment. Topics include: managing anxiety about cancer recurrence, sadness, depression and other emotions; understanding how cancer impacts relationships; and learning how to eat and exercise to be healthy and reduce risk of recurrence. Each session includes an expert presentation, followed by a facilitated group discussion. This series of classes is free to attend, but registration is required. Learn more and sign up here. This group is for anyone who has attended Oregon Cancer Foundation’s Survivorship Series in the past. This group is for anyone who has been diagnosed with Breast Cancer, at any stage: newly diagnosed, undergoing treatment, and survivorship. All are welcome. This group is for anyone diagnosed with cancer, at any stage of their journey. This group is for anyone who has been diagnosed with any form of gynecological cancer, at any stage: newly diagnosed, undergoing treatment and survivorship. All are welcome. Each month, Oregon Cancer Foundation partners with a local Wildtree representative, Erin Cunning, and prepares 100 meals for the month. Ten families each receive 10 prepared and packaged freezer meals that are ready for the slow-cooker. These meals are a source of help and comfort for patients undergoing treatment and their caregivers. For this project, OCF has reserved the incubator kitchen at Hummingbird Wholesale once a month. This fully-stocked commercial kitchen provides the space needed to prep the meals in a safe and sterile environment. The kitchen is located in the Stellaria Building, also the home of Hummingbird Wholesale, at 150 Shelton McMurphey Blvd. in Eugene. No cooking experience is required when you volunteer. If you can chop vegetables, measure spices, open canned foods and fill storage bags with prepared meal ingredients, you’re qualified! All that we request is approximately two hours of your time, that you wear closed-toe shoes for safety purposes and bring your favorite kitchen knife to cut the vegetables. OCF will provide you with an apron, all the instructions and food. Enjoy a great time helping others! If you or your group is interested in volunteering in our monthly freezer meal preparation, please reach out to katie@oregoncancerfoundation.org. Interested in learning the fine art of Argentine Tango? Instructors Charles & Wella Augustine offer classes every Friday at Celebrations Belly Dance and Yoga Studio, with proceeds benefiting OCF. “Argentine Tango is very different from the Tango in International and American ballroom dancing,” says instructor Charles Augustine. “It’s an improvisational social dance. There’s no competition involved; it’s really about everyone’s own personal style, despite their skill level.” Classes are offered for beginners, intermediate and advanced dancers. These are drop-in friendly classes, and you do not need to come with a partner. Learn more about upcoming classes by following Dance for a Cause on Facebook. Looking to get active and physically stronger? Team Endure is currently recruiting members. This local group brings together people with different fitness levels—beginners to seasoned athletes—to train for endurance events. But they don’t just take on the challenge for their own benefit; they do it to support cancer patients through OCF’s Financial Assistance Program. Team Endure trains year-round, participating in events, like century bike rides, triathlons and half marathons, but their main focus is participating in the Pacific Crest Weekend Sports Festival each June in Sunriver, Oregon. For more information, email: teamendure@oregoncancerfoundation.org. Oregon Cancer Foundation continues to partner with Positive Community Kitchen (PCK) to offer free monthly classes on healthy eating and nutrition, provided for cancer survivors and their families. Shanna Hutton, PCK’s board president and a former chef for the organization, leads the classes, offering nutrition information and demonstrating tasty ways to prepare meals that are gluten-free and feature seasonal ingredients. PCK is a nonprofit in Eugene that prepares and delivers nutrient-rich, organic meals to people fighting life-threatening illnesses. The NOURISH: Food for Life classes are held at various locations throughout the community each month. For the complete schedule, click here. Financial assistance is the core of Oregon Cancer Foundation, providing stopgap funds to patients undergoing cancer treatment in Lane County. Patients can apply for assistance by calling 541-632-3654, or email requests@oregoncancerfoundation.org. 2/27/19 UPDATE: Due to the unexpected snowstorm and subsequent power outage, the deadline for submissions has been extended until March 4th to allow for those affected by the storm to submit their nomination. Cancer is not an easy road to travel. Fortunately, there is no shortage of people willing to dedicate their talents, skills and time to making the cancer journey easier through their efforts to heal, support and advocate for patients and their families. Oregon Cancer Foundation is now accepting nominations for its Wings of Hope Awards, to honor individuals who demonstrate extraordinary caring and compassion to those in our community affected by cancer. If you know an outstanding individual in the health care field or a community member who is making a difference to support cancer survivors in our area, please fill out our nomination form here and tell us more. All nominations must be submitted by Friday, March 1, 2019. The Oregon Cancer Foundation (OCF) recently received a $10,000 tier-one grant from the Knight Cancer Institute to help identify and address the needs of caregivers in Lane County. The reality is that cancer affects more than the person diagnosed with the disease, says Oregon Cancer Foundation Executive Director Amy Johnston. Caring for a family member or friend with cancer can be a stressful and overwhelming experience. Unfortunately, there is a shortage of support and educational resources available to caregivers in our community. “Often, it’s their village that goes through the experience with them—their family members and friends who are caring for them. If we can identify what types of resources they need and then provide a roadmap on how and where to access that support, we can make the caregiving experience a little easier,” she says. We will gather information from social workers, patient navigators, doctors and nurses in the community who work to guide patients and caregivers from diagnosis through survivorship. We will also speak with caregivers to gather information about their personal experiences and challenges. We will then create focus groups to further explore the most pressing issues. Once the completed surveys are analyzed, we will move forward on creating solutions to address caregivers’ needs. The entire process—from information gathering to solution planning—is expected to take about a year. If you are currently a caregiver or have been a caregiver to a cancer patient in the past and are interesting in completing the survey, please email andrew@oregoncancerfoundation.org or call the Oregon Cancer Foundation office at 541-632-3654. 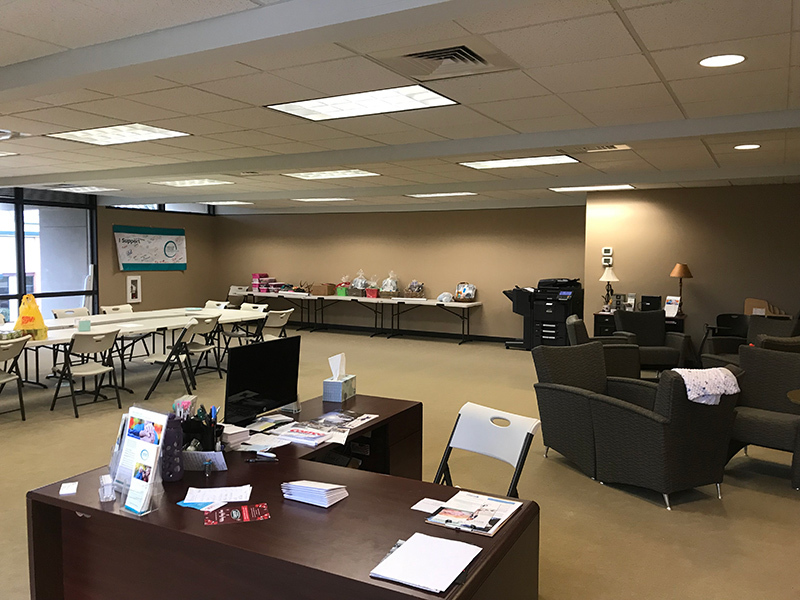 This holiday season, the Oregon Cancer Foundation (OCF) is thankful for an incredible gift that is allowing us to better serve cancer survivors in our community—new office space! Our new 2,000-square-foot office on Oakmont Way, in Eugene, originally served as the field office for Chambers Construction, while the company was building the Hyatt Place Eugene hotel at Oakway Center. As that project neared completion, Chambers Construction president and OCF board member Dave Bakke contacted Steve Korth at McKay Investment Company, which owns the office space. McKay Family Investments gifted OCF the office space rent-free for two years, giving OCF our first brick and mortar home. Chambers Construction generously donated time and materials to spruce up the space, installing new carpet and giving the walls a fresh coat of paint. “This project aligns perfectly with our company’s core purpose, which is to build things that are important in people’s lives. Providing this space to the foundation is going to allow OCF to help more people in more ways,” Dave says. The new OCF office is in a convenient location and offers plenty of parking. Executive Director Amy Johnston says she couldn’t be more grateful for this incredible gift. “The office includes a large open space that is perfect for classes and support groups. We will be able to serve more patients with more programs and resources. This is more than we could have ever hoped for,” she says. I finished treatment, now what? Registration is now open for OCF’s Winter and Spring Survivorship Series, a 10-week series of classes that provide information and support to manage the challenges that arise after cancer treatment. Understanding how relationships are impacted while on the cancer journey. Learning how to eat and exercise to help stay healthy and reduce risk of recurrence. Managing anxiety about cancer returning, sadness, depression and other emotions. Exploring mindfulness, meditation, spirituality and other forms of self-care and healing. Discussing cognitive and behavioral strategies to increase well-being and resiliency. Learning about integrative care and alternative healing methods, such as naturopathy, acupuncture, massage and other complementary approaches and how they can improve your cancer journey. If you want to know what it’s like surviving a cancer diagnosis, ask Charity Crosby. Since she learned she had breast cancer in November 2017, she’s been an open book, sharing her experiences with the hope that she can make someone else’s journey a little easier. As a real estate broker in Lane County for 21 years, Charity is very much a people person. Charity’s life took an unexpected and devastating turn when her younger sister Fawn was diagnosed with an aggressive form of cancer. Charity, who naturally exudes positivity, began to experience the physical and emotional toll of her own cancer diagnosis. Since her diagnosis, Charity has shared her journey on Facebook and discovered that posting updates is a good way to keep family and friends informed of her situation. It also spurs others to send her positive thoughts and support. “When I have bad days, I will go through those posts and I will read the comments people have left me and they give me hope,” she says. The oldest of seven siblings, Charity is surrounded by family; her mom and her daughter are by her side during every medical appointment. But when her medical bills began to impact her finances, Charity realized she needed a different kind of support. Her care team at Willamette Valley Cancer Institute and Research Center connected her with Oregon Cancer Foundation’s Financial Assistance Program, which provided Charity with gift cards for groceries and gas, so she could continue to get to and from work and treatment. Since Charity was diagnosed, she has completed chemotherapy, underwent surgery and is currently receiving radiation therapy. She was one of 10 Red Carpet Survivors honored at the Girls Night Out celebration, the finale to the Bras for Cause campaign that raised $108,000 for Oregon Cancer Foundation this fall. Charity celebrates her last chemotherapy treatment with her mom. Charity was one of 10 Red Carpet Survivors honored at OCF’s Girls Night Out Celebration. Chambers Construction is known for building impressive projects, from the Hyatt Place Eugene hotel and Ninkasi’s administration building to Western Beverage’s distribution center and the Pete Moore Hospice House. The company’s employees are also proving themselves to be mighty fine bra builders. Chambers Construction is one of more than a dozen businesses displaying colorful bras they created as part of the Bras for Cause annual fundraiser to support Lane County cancer patients through Oregon Cancer Foundation (OCF). Chambers has created two Bras for Cause entries—”Screw Cancer” and “Save the Hooters“— to raise money for OCF and to provide a fun team-vs-team competition within the company. In addition, employees are raffling off prizes, including a $50 iTunes gift card, a gift basket of goodies from Dutch Bros., and several gift boxes of wine. Raffle tickets are $2 each, three tickets for $5, or 7 tickets for $10 and can be purchased at Chambers Construction’s main office on Judkins Road in Eugene. This year’s Bras for Cause goal is to raise $100,000 to support OCF’s Financial Assistance Program, which helps patients with real, in-the-moment needs, like buying groceries or paying utility bills or rent. Have you voted for your favorite bra? $1 = 1 vote and voting runs through Oct. 31 at brasforcause.org. All proceeds raised benefit patients through OCF’s Financial Assistance Program.